Edit July 2011: An even easier way to embed a custom font in your website is with Google Web Fonts. @font-face is a simple and elegant way to embed a font in your website and is in most cases superior to all other font embedding methods. It requires only the font you wish to use along with some CSS. Best of all @font-face is fully compatible with all major browsers. It’s search engine friendly and setting it up is quick and easy. No coding required. Sounds too good to be true doesn’t it? You basically just need to buy/download the font you wish to use (you must have a license to use the font) and then add the following rule to your style sheet to reference your font. As an example let’s embed the Action Man font into our website. 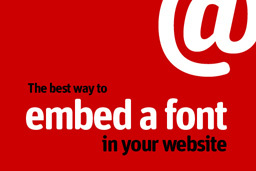 Now that your font is embedded in your website you can use it as you would any other font. Lets use our embedded font on our h1 tags like so. In order for your font to be cross browser compatible you will need a few different font file types for different browsers. Font Squirrel is a great resource that has made it very easy to use @font-face on your website by providing @font-face kits. These kits basically contain the original TrueType or OpenType fonts for Firefox, Opera, Safari and Chrome along with the EOT fonts for Internet Explorer. There are lots of great fonts to choose from, many of which are free for commercial use. Surprisingly, there are not really any issues with using @font-face to embed fonts in your website. But there are two things to be aware of. Firstly, your font will need to be downloaded by your website viewers which will usually cost you around 30KB of bandwidth for a typical font (which isn’t much at all). Secondly, as your font loads your website viewers may sometimes see the default font flash first for a second on the web page. Most people can live with that. @font-face is quick to setup, simple to use, light weight, SEO friendly and browser compatible. The best method I have come across to embed a font in a website. Really useful cheat to embed a font into our modern websites. Good post, @font-face is excellent. Great tool, but it doesn’t seem to cooperate with free Godaddy hosting (I have a client with this set-up, unfortunately). Thank you so much for this, you just saved me hours! I was just about to try and install sifr, this is way better. This has worked great, however I now have the @font-face code showing on the finished webpage, how do I mask this. Apologies if this is a basic question but this is my first website build so learning curve is really step at the minute.